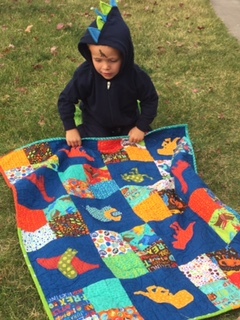 Val's Quilting Studio : A Dino Happy Boy! 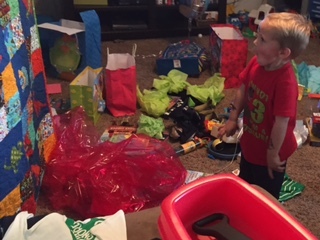 Yes....he loved his new dinosaur birthday quilt! ...and all the dinosaurs got hugs and kisses too. ...and warm as our newly-three-year-old finally fell asleep. It was a fun day and even better that such a little guy appreciates his homemade quilts so very much. That in itself makes our quilty hearts smile huh! I'm smiling just seeing the pictures. Thanks for sharing them. It is Dino Love! He certainly is a cutie!! Wow - 3 already!! Love that face, too. Took me a while to realize he had a dino tat on his head - duh. And the dino suit just is a must at a dino party. Ah he's so sweet!! 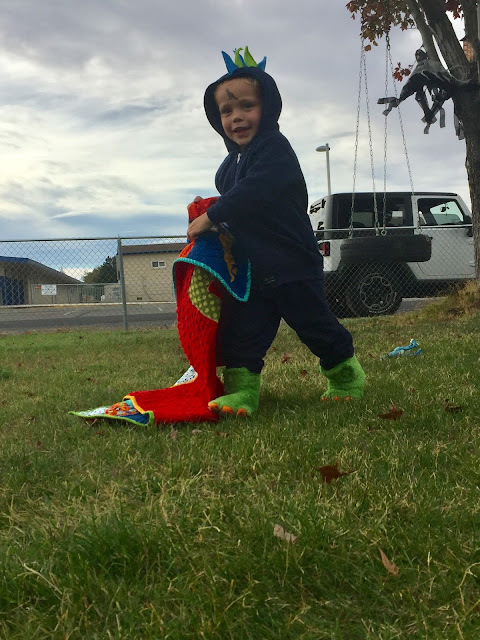 Looks like he loved his Dino quilt!! What a great quilt!! Looks like he LOVED it!!! Love the little dino outfit too... so cute! His sweet little face is priceless. How cute your little grand guy looks in his dinosaur outfit. More precious memories for you all. Oh so cute, he really is into dinosaurs! Sweet! I knew it would be perfect for a dinosaur loving boy. What a sweet face. The quilt was perfect as it is obvious he loves dinosaurs. How sweet! It's always fun when they love what you make them. Even at 17, I get regular hugs for making DT her special quilts. W-a-a-a-a-y-y-y-y too cute! My son loved dinosaurs when he was 4, and this brings back many memories. 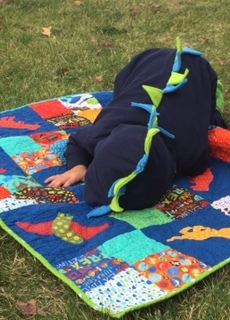 Except I didn't quilt then so he had no chance of dragging around the cutest little dino quilt ever. Big smiles for you! I LOVE the photo of his reaction to the quilt. That is so cute. Love that he gave the dinos hugs and kisses...so sweet! Gorgeous quilt and gorgeous little boy, what lovely photos. You could not wish for a better response to your quilt Val. Your little guy is sooo adorable! Great photos!